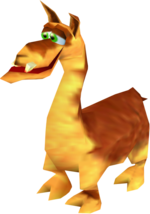 The Llama is a minor character who appears in the Angry Aztec stage of Donkey Kong 64. He owns and lives in his own temple in the world. The Llama is imprisoned inside a cage in the first main area following the entry passageway. Just as Donkey Kong enters the main area, the Llama vaguely hints that he can be freed in the clouds. To free him, Donkey Kong must access a Donkey Kong Pad at the stairway to the Llama's Temple and complete a Barrel Cannon challenge. By doing so, the bars of the Llama's cage rises, and he leaves to his home, the Llama's Temple, and leaves behind a Golden Banana for Donkey Kong. Later, when Donkey Kong enters the Llama's Temple, the Llama is shown sleeping on a floor above a pit of lava. Lanky is imprisoned in a room below the pool of lava. To reach his area, Donkey Kong must navigate the Temple for a Music Pad and perform Bongo Blast on it. This wakes up the Llama, who spits into the lava, cooling it into water. He does not have another role since, although he stays awake in the same position and yawns at times. The Llama is similar to Gobi from the Banjo-Kazooie series. Aside from both being Camelids, the Llama and Gobi are both trapped in their respective desert-themed world, and they solve puzzles with by spitting. In fact, in an early plan for a lava-themed area removed from the first Banjo-Kazooie game, Gobi's spit would have been used to cool lava, just like the camel's is. A major difference with Gobi is that Banjo and Kazooie must attack him to solve puzzles. This page was last edited on October 27, 2018, at 22:42.